In the last section we have installed TensorFlow on Windows 10 computer, now in this session we will make our first Hello World TensorFlow example. After installation of Python and TensorFlow on Windows computer we will proceed with the programming series and first create famous Hello World program. We will write and run TensorFlow Hello World program. TensorFlow is machine learning and distributed statistical computing framework which utilizes the power of modern CPU, GPU and TPU for running machine learning programs. TensorFlow is open source and famous deep machine learning framework used for developing large scale deep learning system. In in this series of FensorFlow tutorials we will first make our Hello World program and run it through python interactive session. If you have not installed Python and TensorFlow then check our tutorial on installing TensorFlow on windows 10 and then come back to this tutorial. 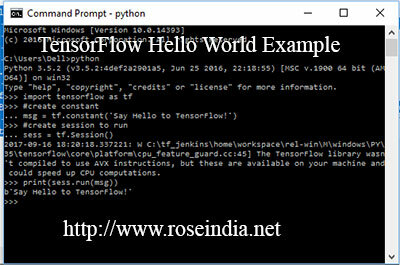 Here is the simple program in TensorFlow which prints "Say Hello to TensorFlow! ", when executed. Constants value cannot be modified once created. 2017-09-16 18:20:18.337221: W C:\tf_jenkins\home\workspace\rel-win\M\windows\PY\35\tensorflow\core\platform\cpu_feature_guard.cc:45] The TensorFlow library wasn't compiled to use AVX instructions, but these are available on your machine and could speed up CPU computations. In this session you learned to write your first TensorFlow Example program. In the next session we will learn how to use variables, constants in TensorFlow.